Home Features Dispenser Disconnects – Critical safety net that is overlooked? Dispenser Disconnects – Critical safety net that is overlooked? Technology of fuel dispensers has kept pace with the fast-paced society of today. Present day fuel dispensers often come configured with a multitude of options. Fuel dispenser designs in the past incorporated only basic circuits related to a suction pump and an on/off switch. Dispensers today come with LCD displays and have options that range from onboard intercoms, video streaming capabilities to point-of-sale card readers. 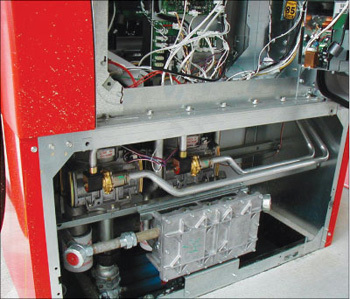 All of the advancements in fuel dispenser designs have increased the number of electrical/electronic circuits that are present at fuel dispenser junction boxes. Photo 1. Emergency shut-off switch located within 30m (100ft.) of a fuel dispensing device which it serves. Fuel dispensing electrical circuitry connections consist of fuel dispenser supply power (line voltage, usually 120 Volt-ac) as well as low-voltage remote signaling circuits and communications circuits. In many cases these circuits route back to multiple interface cabinets and control panels making it difficult to ensure that all circuits are disconnected at the time of a catastrophic event or for routine maintenance. Photo 2. Low-voltage remote signaling circuits and communication circuits inside a motor fuel dispensing devise. (A) General. Each circuit leading to or through dispensing equipment, including equipment for remote pumping systems, shall be provided with a clearly identified and readily accessible switch or other acceptable means, located remote from the dispensing devices, to disconnect simultaneously from the source of supply, all conductors of the circuits, including the grounded conductor, if any. Single-pole breakers utilizing handle ties shall not be permitted. NEC514.13 Provisions for Maintenance and Service of Dispensing Equipment. Each dispensing device shall be provided with a means to remove all external voltage sources, including feedback, during periods of maintenance and service of the dispensing equipment. The location of this shall be permitted to be other than inside or adjacent to the dispensing device. The means shall be capable of being locked in the open position. The impetus of disconnect requirements in both codes is to eliminate incidental contact, shorting of a circuit with incendive energy in a classified hazardous area and the possibility of starting a remote pump that could release product during maintenance. 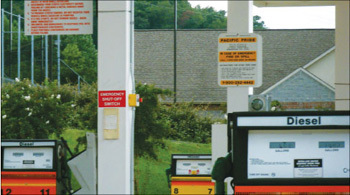 Although the NEC is nationally adopted and NFPA 30A is recognized in fire codes that are nationally adopted, fuel dispensers facilities across the nation rarely comply with disconnection requirements. From a practical standpoint, the disconnection requirements reduce the possibility of accidental release of a flammable/combustible fluid and the possibility of an electrical short in a classified area. The enforcement of disconnection requirements is a shared responsibility of authorities having jurisdiction that are either electrical inspectors and/or fire officials. The predicament is that AHJs haven’t questioned the limitation of installed dispensing equipment and interconnection of related systems. The reason for this is fewer dispensing facilities are built than residential or commercial installations and AHJs are not as versed in requirements and the way point-of-sale circuits are interconnected.